Every now and then a game comes around that defies classification. 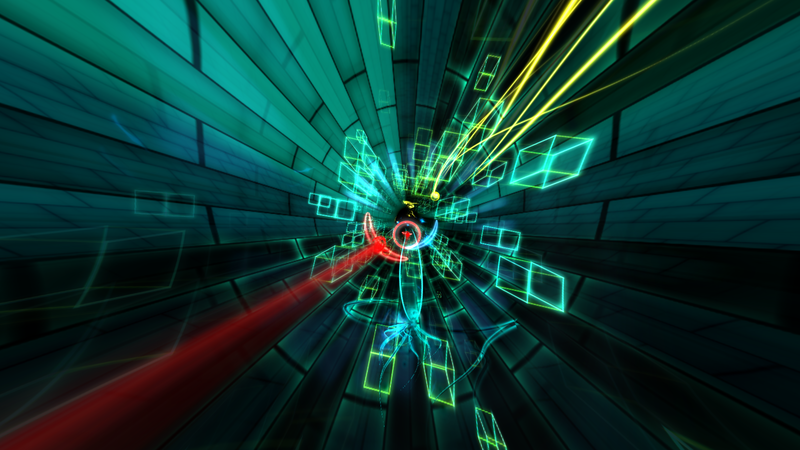 Such is the case with Dyad, an exciting new PSN downloadable title that blends together puzzle, racing, shooter and music elements while sprinkling a few drops of acid to the mix. For those infatuated with wild visuals and vibrant colors, this is pure psychedelic bliss. It’s a bit difficult to actually describe Dyad, as it is one of those games that just needs to be played to understand. While perusing trailers and gameplay videos, I was more confused than anything. The flashing lights, frenetic racing and kaleidoscopic colors looked overwhelming, and I had no clue what was going on. From an outsider’s perspective, I suspect this is a common occurrence. However, as soon as I picked up the controller, everything just clicked. 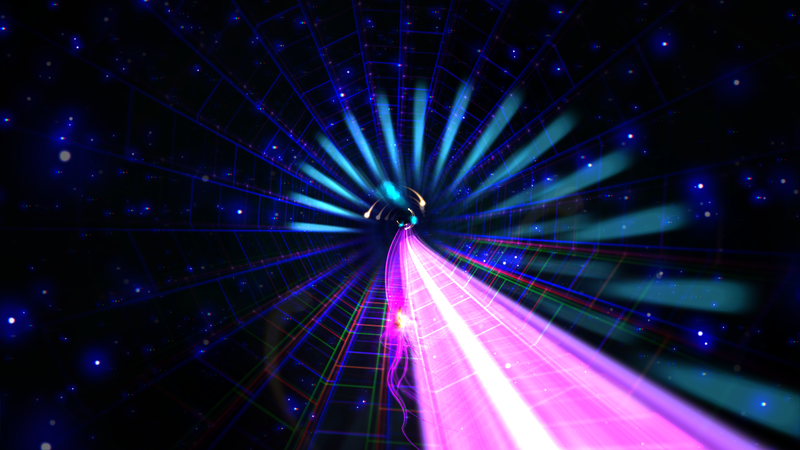 Dyad has 27 levels, and the core gameplay has a similar theme throughout. Each stage takes place in a tunnel, and you control a squid-like character that can maneuver in the form of a circle. Various enemies and obstacles are presented off in the distance, and it is your job to manipulate these for your benefit as you frantically push forward. Each level has its own goal, and these help spice up the overall gameplay. Some early levels require “hooking” enemies together in order to boost speed, whereas others require the use of “lancing” in which foes are essentially consumed. While the gameplay may sound confusing in text, the actual learning curve is quite simple. This is a textbook example of “easy to learn, difficult to master.” It’s possible to whip through the 27 levels in a matter of a couple hours, as all it takes to move onto the next is finishing a stage with a one star rating (out of a possible three). By getting the full three stars in a stage, a brand new challenge is unlocked in the form of trophy levels. In these, you are given a much more difficult goal to complete before time is up, with the reward being a trophy. In some of the later levels, it’s hard enough to get three stars, so completing many of these trophy levels can be an astonishing achievement in itself. Since Dyad is a single player affair, any and all replay value comes in the form of beating these challenges while also trying to move up on the online leaderboards. Normally I don’t care about my online rankings, but I felt a tremendous sense of pride when I was able to finish a trophy level fast enough to be ranked sixth on the worldwide leaderboard. In that sense, it could easily get addictive to continually try to push your way to the top. While the gameplay is impressively well-tuned, most people will be interested in Dyad because of its hallucinogenic properties. This is very much an audio/visual experience. 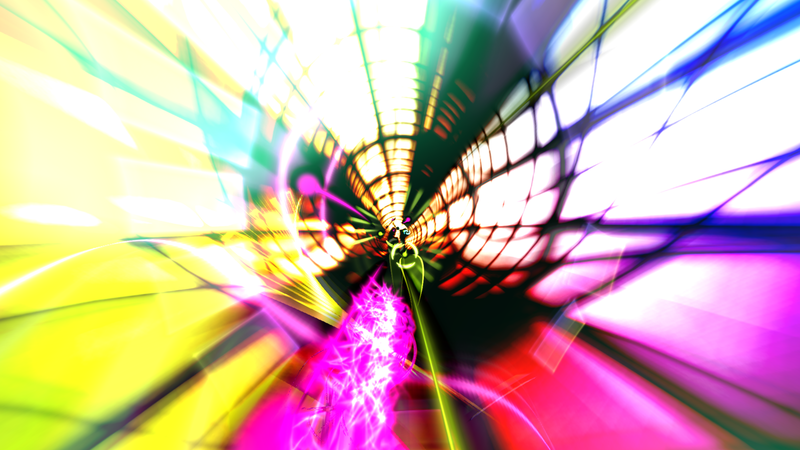 While vivacious colors flash on screen, the game’s electronic music is perfectly synchronized with the action, creating something of a sensory overload. While screenshots give an idea of what the game looks like, the overall immersion from this is something that must be experienced. Many of the later levels move at breakneck speeds, creating a chaotic feel that certainly warrants the game’s preemptive epilepsy warning. It is therein where Dyad’s biggest weakness can be found. Sometimes it can be difficult to keep up with the action on screen, especially as momentum builds faster and faster. There were a few instances where I resorted to button mashing until things slowed down a bit, and occasionally my character was moving so fast it was near impossible to play strategically. While a bit problematic for attempting to achieve high scores, these reckless segments are still thrilling, albeit not in the same manner as others. Quite simply, I haven’t played anything like Dyad before. While it has throwbacks to other games such as Rez and Tempest, it is very much a fresh and unique experience. The frantic gameplay and polychromatic visuals aren’t for everyone, but for those willing to give it a chance, it won’t take much to get hooked. Dyad is one of the more intriguing titles to be released this year, and I am looking forward to seeing what designer Shawn McGrath comes up with next.